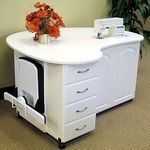 Why Buy by Fashion Sewing Cabinets of America? * Best Value: With the highest grade materials and quality construction, we give you more for your dollar. * Quality Materials: Our Doors are real oak raised panel or state of the art contour laminate as noted. Sewing surfaces are Nevamar Laminate, Contour Laminate, or Melamine (used on our economy units as described. 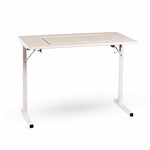 * #1 in Service * USA made: We have been manufacturing furniture for over 30 years. * Most Innovative: We were first with an open arm adjustable lift, first to use an "Insert" to adapt to different sewing machines, the first to implement "Contour Laminate" surfaces for sewing, among other notables (see Features & Options). Compare us to the competition. * Broadest Line of Sewing Furniture: We manufacture High Line Sewing Cabinets to Economy Sewing Tables and Component Sewing Furniture systems.